What a fantasy shirt! It’s available from the Thomas Pink website and I so want to order one. Oh, I know intellectually how to sew a detachable collar: David Page Coffin discusses it in his book, Shirtmaking: Developing Skills for Fine Sewing . He’s even discussed it with me personally on a sewing board. But still, I want to hold this shirt in my hands, inspect how Thomas Pink of Jermyn Street London performed the construction and soak in the precision. But back to the fantasy shirt: I want to see the shirt on a live, standing right in front of me, man. I want to see the collar and cuffs exchanged and watch how magnificently the tone of the shirt is changed. I want to study how the changes affect the wearer. 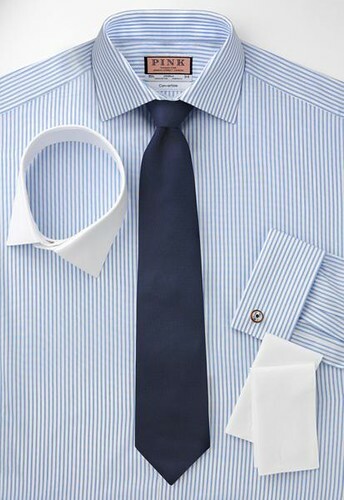 Surely the white collar and cuff set will be more dressy, more uptown smart, while the blue and white stripe will be more casual and approachable uninterrupted by a change in color. And what about the kind of man who would order this shirt? He would be looking for quality in fabric and ease in care, as a perusal of the Thomas Pink website reveals that the fabrics they use will provide both. He would also be looking for versatility in his investment of $175 so he would have the spare change available and he would have the need to look great. He would be the type to take care of his body as the fit is cut for a slim fit and he would be attracted to the crisp blue and white strip. He would want to look alert but laid back, ready for business, but not pushing it. He would also have to take good care of the shirt. He’d have to be able to plan ahead and try to not have to change a tire in a torential rain nor fix a loose connection under the hood. He would have to be very careful when dining on sauced pasta and unlike James Bond, he would have to forego leaping into a fray to save the day. Reality often hits hard above the belt as well as below. The body of the shirt is not sold separately. Are custom shirt makers to hear in the future: “I have the collars and cuffs, make me a shirt that will match”? Posted in Men's Dress Shirt, Sewing. Bookmark the permalink. Just when you think you have shirt making down, there is always something else to learn. That is what I love about sewing! In the early days a shirt with detachable collar and cuffs was ment for the poor man who did not have enough shirts in the closet so he could transform the shirt into a different one and still looks good .The only washing would be the daily wash of the collar and cuffs instead of the whole shirt. This shirt is from a different order and like you I am curious to see the way the collar and cuffs attach to the shirt. I do know the usual way but I can not imagine using buttons at the side of the neck which I think is not a pleasant way to feel. I could not see buttonholes either at the separate cuffs and collar from the link. Just dropping you a note to compliment you on your blog! Being a sewing enthusiast myself, I appreciate the opportunity to learn from and share information with other sewers. How interesting Mary Beth. I never knew the shirt would be called a “grandfather” shirt without the cuffs and collar. I wonder where that came from? Also, love the new blog look! It’s bright and soothing at the same time. It appears to me that the stand of the collars fit inside the shirt collar stand. The buttons or snaps are on the outside of the collar stand and the button holes or other part of the snap are collar stand of the shirt. Maggie Norris makes shirts with this same feature, although I think she has interchangable french cuffs, and not collars. I would also love to know how she attaches them to the shirt body. As far as I know, Lourdes, detachable collars and cuffs are fastened to bands around the neck and wrist of the garment through the use of small buttons and buttonholes. At one time I was very interested in making such things but I’ve found that I’d rather not have extra choices and pieces to one shirt, but rather 2 separate shirts. I have a hard enough time keeping track of cuff links for French cuffs!